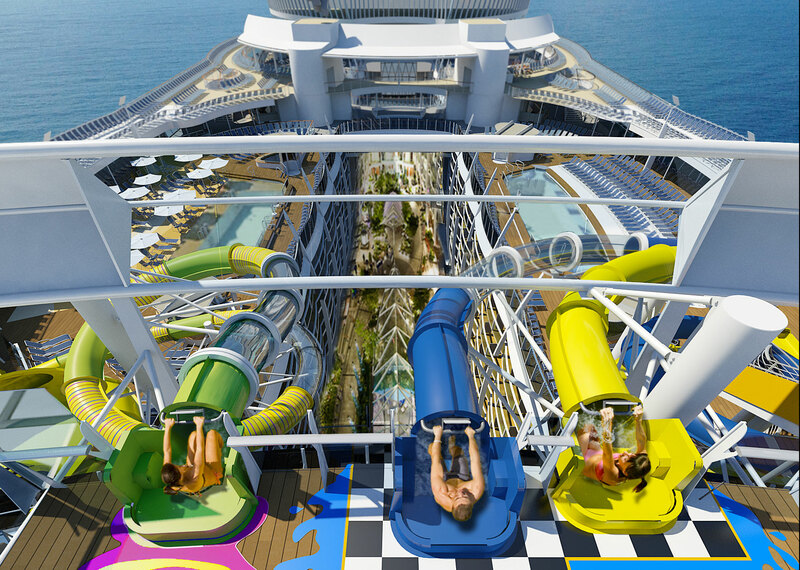 Royal Caribbean have revealed further details about Harmony of the Seas water slides and if you’ve ever wanted a jaw dropping thrill at sea then these slides will offer just that. Harmony of the Seas will become the world’s largest cruise ship once construction is complete in 2016. The cruise line is releasing more details about the ship as we closer to its debut and just revealed are further details about the water slides. All you have to do is just look at the rendering above to see at just how jaw dropping the slides look. 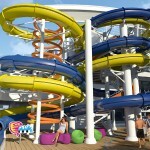 If it’s a thrill at sea guests want then we’re pretty sure Harmony of the Seas water slides will provide just that. 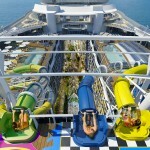 Royal Caribbean revealed the Abyss water slide which will be 10 stories tall and offer total thrills to passengers daring to try it out. The slide will start high up near the Aquatheater and then go all the way to the boardwalk neighbourhood near the bottom. The cruise line has released some renderings which you can see below of the other water slides known together as “The Perfect Storm”. The three slide known as the Perfect Storm will cater to guests wanting something not as dramatic as the Abyss! These slides will be located at Harmony of the Seas Sports Zone above Central Park which Cruise Hive previously reported on. The slide are called Cyclone, Typhoon and Monsoon. These slides onboard the ship will be a new experience for the fleet as Royal Caribbean have not got any slides on any other ship. 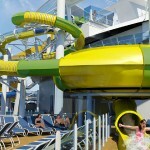 The company now joins most other major cruise lines with thrilling water slides. In recent years the industry has been seeing a trend for more creative and dramatic slides. In Addition to the water slides Harmony of the Seas has had its exterior construction completed and will now move into the next phase. All the interior spaces will start to take shape ready for the vessels debut in April 2016. Harmony of the Seas will be 227,000 gross tons and will carry 5,479 guests at double occupancy. The ship is currently being built at the STX shipyard in Saint-Nazaire, France.